Gabriel: Should The Bills Follow Trubisky & Goff Plans? Like myself and many others have already said/written several times since the Draft, the ideal situation for Josh Allen would be to sit, watch and learn for all/most of his rookie year. When a rookie quarterback has to play before he is ready it can actually cause more problems with his development. In the last two years, two quarterbacks who were drafted high ended up playing before their team wanted originally wanted to play them. Let’s look at how it affected their progress. In the 2016 Draft, Jared Goff was the first overall selection by the Rams and right after the draft the Rams announced that Goff would sit and learn his rookie year. When the Rams got off to a horrible start if was decided after game nine that he would be inserted as the starter. The results weren’t that good and there were many who felt that Goff was going to bust. In those final seven games, Goff completed 112 of 205 throws for a 54.6% completion percentage, 1089 yards, five touchdowns and seven interceptions. Part of the problem was Goff didn’t have a strong receiving corps in which to throw to and the design of the offense wasn’t that good. After the 2016 season, the Rams hired a new coaching staff and surrounded Goff with not one but three strong quarterback coaches in Head Coach Sean McVay, Offensive Coordinator Greg Olsen and quarterback coach Matt LaFleur. The Rams personnel staff then went out and got new offensive skill players so that the offensive side of the ball had the talent that would help Goff succeed. Some of the new players that Goff had in 2017 were wide receivers Sammy Watkins Robert Woods (both former Bills), draft choice wide receiver Cooper Kupp and draft choice tight end Gerald Everett. The new offensive scheme and talent made as world of difference as Goff improved his completion percentage by eight points and his touchdown to interception ratio improved to 28 TD’s and only 7 interceptions. The Rams also went from worst to first and made the playoffs. This year they look to be a Super Bowl contender. 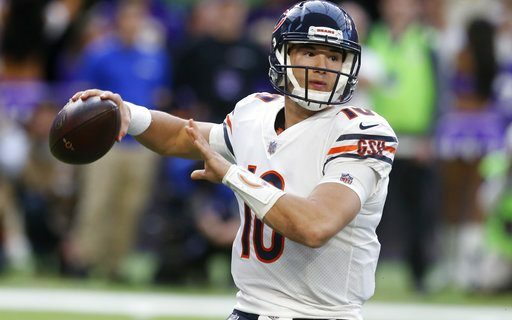 The Chicago Bears last year drafted Mitch Trubisky with the second overall pick and promptly said he would sit and learn behind Mike Glennon. In the first four games of the 2017 season, Glennon proved to be a disaster and Trubisky was inserted as the starter for game five. The Bears, knowing he was not ready, played a very watered down offense the first few weeks Trubisky played and by the end of the season he was running a full offense and fairly effectively. For the year he completed 59.4% of his throws and threw seven touchdowns and seven interceptions. The Bears did not win enough games and Head Coach John Fox was fired. Bears General Manager Ryan Pace somewhat followed the Rams blueprint and brought in a young offensive minded Head Coach and strong quarterback guru in Matt Nagy. Like the Rams, the Bears staff also became heavy with quarterback minded coaches. Also like the Rams, the Bears Personnel Department went out and found skills players in which to surround Trubisky. In free agency the Bears signed wide receivers Allen Robinson and Taylor Gabriel as well as move tight end Trey Burton. In the Draft, the Bears selected wide receiver Anthony Miller in the second round. The new offense the Bears are running will be very similar to the offense run by Kansas City and Philadelphia. With Trubisky being very athletic there will also be an emphasis on RPO’s as that type of play fits Trubisky’s skill set. It remains to be seen how successful the Bears will be this season but many feel they will be one of the most improved teams in the NFL. Now let’s look at the Bills. The one main difference between the Bills and the Rams and Bears is Head Coach Sean McDermott is not in trouble. McDermott did not like the way the offense was run in 2017 and soon after the season he replaced Offensive Coordinator Rick Dennison with Brian Daboll. Daboll will bring in a new offensive philosophy and we can rest assured that the play calling will be much different than we saw a year ago. The similarities to the Rams and the Bears is that the Bills have a rookie quarterback whom they don’t want to play in 2018. Also like both the Rams and Bears the wide receiver corps on paper looks to be one of the weakest in all of the NFL. Reality is we won’t know how good or bad the group is until the regular season gets gong in another five weeks. If either A.J. McCarron or Nate Peterman play well, the Bills can stay true to their plan of letting Josh Allen sit and learn. Should either or both falter, though, there is no doubt that Allen could be the starter the second half of the 2018 season. If that happens, then we all know the Bills will be out of playoff contention and will most likely have a high draft choice next year. You can also bet that come next off-season the Bills will concentrate on finding skill players in which to surround Allen in both veteran free agency and the Draft. The best way to help Allen succeed is to have a strong offensive line and a as strong a group of receivers the Bills can find. There are a lot of similarities between this year’s Bills and the 2016 Rams and 2017 Bears. We will find out soon enough if the whole season plays out in a similar fashion.